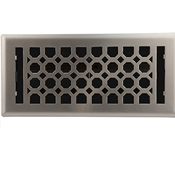 Trusted brand Accord floor vents in a unique Charlotte geometric design. This satin nickel register will surely add to the decor of any room in your home. Constructed of steel, these decorative floor registers are rated to hold up to 200 pounds. The tranish and corrosion resistant finish paired with the plastic damper, means the register is made to last. Each Accord floor vent is made of ABS resin plastic and is fully adjustable. The satin nickel registers are available in sizes 4x10, 4x12, 4x14 and 6x10. 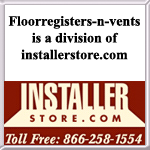 Wondering what size of decorative vent cover to order? Use the actual hole/opening size in the floor and NOT the existing register faceplate dimensions. A floor opening/hole size of 4" x 10" would need a 4x10 register. This attractive Charlotte decorative floor register design is also available in the finish Oil Rubbed Bronze.